Poirier opened the fight with leg kicks and left hands in the opening minute. 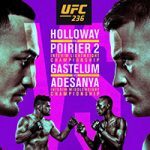 He swarmed on Holloway with punches, but Holloway hurt him with a counter hook and followed with more punches as Poirier retreated to the cage. Poirier recovered and he rocked Holloway with a big right hand. This led to an exchange of power punches and Poirier rocked Holloway two more times. Poirier continued to tag Holloway with hooks and uppercuts as the round progressed, but Holloway remained on his feet. He landed a brief flurry of his own, but Poirier outstruck him in the final minute and he opened a cut below Holloway’s right eye. 10-9 Poirier. Holloway struck to the head and body of Poirier in round two and Poirier responded with a combination. Holloway continued to target Poirier’s midsection with punches and Poirier fired off an elbow in return. He ducked under most of Holloway’s punches and answered with a solid combination. Holloway peppered him with quick punches and body kicks as Poirier threw single strikes in return. Poirier hurt Holloway with a left hook, but Holloway recovered. A lead right hook sent Holloway stumbling backwards, however, and the fighters traded punches before the bell. 10-9 Poirier. Poirier landed counter right hooks and two body kicks early in the third round. Holloway’s left eye swelled up and Poirier targeted it with more right hands. A lengthy flurry landed for Poirier, but Holloway fired back with one of his better combinations of the fight. He landed a series of jabs until Poirier answered with a one-two. Both men landed jabs and straight punches, but Poirier’s had a much greater effect and Holloway’s face swelled up. Holloway teed off with a combination of more than a dozen punches and jumped in with a knee, which Poirier caught. Poirier could not get Holloway down and he ate a series of elbows for his efforts. Close round. 10-9 Holloway. Poirier took Holloway down against the base of the cage in round four. Holloway worked back up to his feet and landed a jumping knee to the body. He punished Poirier with punches as Poirier retreated to the cage wall. Poirier regained his composure and pressed forward with lunging lefts and rights. Holloway attacked the body with punches and a knee as Poirier slowed down. Poirier landed a flurry and a knee that opened a huge gash on Holloway’s forehead. He began to bleed heavily, but continued to throw punches as Poirier shot in for a takedown. Poirier got Holloway down and Holloway immediately trapped him in an Anaconda choke just as the round ended. 10-9 Holloway, barely. Stiff jabs and straight punches were exchanges throughout the opening minute of round five. Poirier landed a hard left cross and Holloway began to bleed from the forehead again. Overhand lefts and rights landed for Poirier as Holloway’s eyes swelled up even more. Both men landed left hooks and Holloway attempted a head kick. Poirier landed a three-punch counter combination and looked to take Holloway down against the fence. Holloway stayed on his feet and the fight ended with a final exchange of looping punches. 10-9 Poirier. Winner: Dustin Poirier by Unanimous Decision (49-46, 49-46, 49-46) after five rounds. He improves to 25-5-0, 1 NC and becomes the UFC Interim Lightweight Champion. The fight began with an exchange of leg kicks and Adesanya followed with one to the body. Gastelum landed two left hooks and he knocked Adesanya off-balance with two right hands soon after. Adesanya recovered and the fighters traded left hooks. Gastelum narrowly missed with winging punches and he snapped Adesanya’s head back with a stiff jab. Gastelum landed two more hooks before the end of the round. 10-9 Gastelum. Adesanya opened round two with a series of kicks to the body and Gastelum responded with left hooks. The fighters traded jabs and Gastelum connected with a one-two. Adesanya mixed things up with kick-punch combos and Gastelum scored with another hard jab. He cracked Adesnaya with a one-two, but Adesanya knocked him down with a counter right hook. Gastelum battled back to his feet and Adesanya landed a quick combination. He stunned Gastelum with a right hand and followed with more punches. Adesanya rocked Gastelum with an elbow, but Gastelum recovered quickly and he landed two left hands late in the round. 10-9 Adesanya. Gastelum established his jab in round three and Adesanya countered with leg kicks and a knee. Big power punches were exchanged and Gastelum blocked a head kick. Adesanya scored with two right hands and he pressed forward with another knee. A right hand and a body kick landed for Adesanya as he began to take control of the striking exchanges. Gastelum took him down, but Adesanya quickly scrambled up to his feet. Both men landed leg kicks in the final minute. 10-9 Adesanya. Gastelum was much more aggressive with his striking early in the fourth round and he punched his way into a takedown attempt. Adesanya stayed on his feet and landed a knee to the body. He fired off a big right hand and Gastelum responded with jabs. Adesanya’s left eye began to swell up, but he stayed out of range of most of Gastelum’s punches. Jab-hook combos landed for Gastelum and that set off an exchange of hard punches. Adesanya mixed in kicks and both men connected with straight lefts. Gastelum hurt Adesanya with a head kick and a flurry, but he gave Adesanya time to recover and Adesanya fought back with a nice flurry of his own. 10-9 Gastelum. The final round began with Gastelum walking Adesanya down with punches, but Adesanya cracked him with a three-punch flurry in return. He stunned Gastelum with a straight right hand and trapped him in a standing guillotine choke. Gastelum spun free and took Adesanya down, but Adesanya countered with a triangle choke. Gastelum managed to scramble and escape, but he ate a combination of punches after returning to his feet. Adesanya scored with a hard right hand and he followed with two more. Gastelum mixed things up with kicks, but Adesanya repeatedly tagged him with right hands and eventually dropped Gastelum with one to the jaw. Gastelum stood and tried for a takedown, but Adesanya used elbows to fend him off and he floored Gastelum with two more punches. Gastelum, bleeding profusely from the nose, stood up and was dropped again by punches. Adesanya dove in with elbows on the ground, but Gastelum made it to the bell. 10-8 Adesanya. Winner: Israel Adesanya by Unanimous Decision (48-46, 48-46, 48-46) after five rounds. He improves to 17-0-0 and becomes the UFC Interim Middleweight Champion. Rountree repeatedly scored with kicks to the inside of Anders’s lead leg in the opening minute. He mixed in body kicks and one-two combinations as well. Anders struggled to land anything in return as Rountree continued to target his lead leg. More kicks landed for Rountree and he hurt Anders with one to the body. Anders was noticeably limping as the one-sided round came to an end. 10-9 Rountree, if not a 10-8. The second round began with Rountree landing more leg kicks and he dropped Anders with a straight left hand. Anders recovered on the ground and eventually got back to his feet. Rountree floored him with another left hand and kicked at a downed Anders’s legs. Anders rose to his feet and failed with a desperation takedown attempt. Three punches and a knee to the body scored for Rountree as he continued to press the action. Rountree swarmed on Anders with punches and dropped him with a right hook. He forced Anders to stand and quickly scored with a hard body kick. Another right hook sent Anders crashing to the mat, but Anders refused to give up and he stood back up again. Rountree landed one more combination before the end of the round. 10-7 Rountree. Could be a 10-6. Rountree continued to chop away at Anders’s lead leg with kicks in the final round. Anders managed to land a pair of counter left hooks in return, but Rountree kept the pressure on with leg kicks and one-twos. Anders limped as Rountree attacked with inside- and outside-leg kicks. He followed with a flurry of punches and a kick to the body. Another one-two and an overhand right landed for Rountree late in the round. 10-9 Rountree. Winner: Khalil Rountree by Unanimous Decision (30-26, 30-26, 30-26) after three rounds. He improves to 8-3-0, 1 NC. Jouban tried for an early takedown, but Grant battled back up to his feet and the fighters traded looping punches. Both men landed leg kicks and Grant cracked Jouban with a three-punch combo. A hard leg kick landed for Jouban and Grant responded with a lead left hook over the top. Jouban walked forward aggressively and threw lunging punches that forced Grant to back up. Grant countered a leg kick with an overhand right at the bell. 10-9 Grant. Grant struck first with a powerful right hand in the second round, but Jouban recovered quickly and he spent the next two minutes chasing Grant down with kicks and single punches. Grant landed a one-two and Jouban followed with more left hands. In the final minute, Jouban landed more kicks to Grant’s lead leg and body. Uneventful round. 10-9 Jouban. Grant circled away and threw counter uppercuts and hooks as Jouban looked to set up combinations in the final round. Jouban landed occasional kicks and the restless crowd began to boo the lack of action. Time was eventually called after Grant was kicked in the groin. Action resumed and both men landed left hooks. Jouban followed with a leg kick and the fighters exchanged single hooks again. Jouban took Grant down into back control and he finished the round with punches from the top. 10-9 Jouban. Winner: Dwight Grant by Split Decision (29-28, 29-28, 27-30) after three rounds. He improves to 10-2-0. Krylov opened the action with leg and body kicks and he pressed forward with right hands. St. Preux countered with a takedown and Krylov used elbows to battle back to his feet. He tried to trap St. Preux in a guillotine choke and St. Preux took him down again. Krylov switched to a front choke and stood up against the cage. St. Preux dragged him down and passed to half-guard. He moved to mount and dropped elbows, but Krylov rolled over and scrambled out the back. On the feet, Krylov landed knees and St. Preux appeared to slow down. Krylov just missed with a head kick at the bell. Close round. 10-9 Krylov due to damage. Krylov reversed a takedown into mount in the second round and he landed elbows from the top. An exhausted St. Preux gave up his back and Krylov continued to strike while setting up a rear-naked choke. He got his arm under St. Preix’s chin and secured the choke, forcing St. Preux to tap out. Winner: Nikita Krylov by Submission (Rear-Naked Choke) at 2:30 of round two. He improves to 25-6-0.